Finally, a pair of socks. These were knitted to Kieron Pegg’s Toe up Twins on Ravelry. They’re a little big, but as they’re for winter wear at home, we can get away with a bit of Nora Batty. The yarn was Bendigo Mills Luxury 4-ply, dyed with the two madders – see previous post. Well, maybe not, but I’ve got one. The latest addition to the spindle collection hails from Wales (rhyme on purpose – it’s from NiddyNoddyUK) and is made of pear, is smooth and well-balanced. I’d read and heard that dealganan/fearsaidí (Help with the plurals? Anyone?) wobble a lot. Hmm… well, yes, but not beyond anything that can’t be controlled with a more central spin with the fingers. I find the same with notchless top whorls (and indeed with notched), and maintain that this makes them especially suitable for beginners, a bit like learning to drive in a manual as it teaches you more control. Overall, I’m hooked on the dealgan and am thinking now that a Portuguese spindle would be an unnecessary luxury (he says). 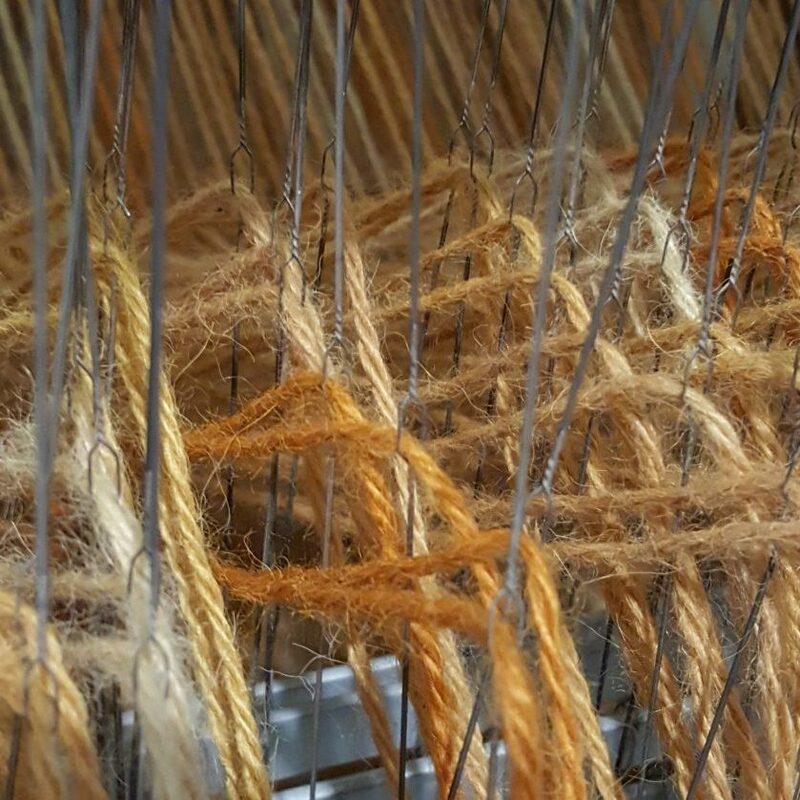 An added bonus was that the dealgan came well-packed, and cushioned amongst layers of combed Lleyn fibre – a breed that I thought I’d never get the chance to spin. I’ve been doing some serious de-stashing of late, more out of necessity than anything else. But it’s produced some good results – mainly that I can see the floor again. I’d bought some weaving yarn from another de-stasher a few years ago, and with it came a bag full of homespun . Most of the yarn was from a fleece in all shades from beige to chocolate, and no doubt from a crossbreed sheep and a beginner spinner; the yarn was spun unevenly and had clearly been done by the same method as my own – stick your hand into the bag and spin whatever comes out, rather than separating the fleece into colours and textures. The yarn was singles, so this was plied double, with the resulting average wpi at around 8, so I chose a four-shaft, 3-1 twill at 6epi. At first this seemed as though it may have had to come down to 4 or 5 epi, but the finished item confirms 6 epi was right. The size was calculated at using most of the yarn, although after weaving most of the blanket, I decided that the last ball looked too felted compared with the rest and cut the project short. It had obvi ously come from the short-and-fuzzies of the fleece, while the rest was noticeably coarser and slicker. And the result? Overall a successful project, and one that has made me want to do more single-colour, larger-scale projects. Now, if anyone out there can translate “stash” and “de-stash” into French, German, Spanish and Irish… there’s some things they just don’t teach you at school or in the text books.